I don't know about you, but I wake up hungry everyday. I hear people talk about not being able to eat first thing in the morning and I truly cannot comprehend. As soon as my feet hit the floor, my tummy is asking for food, and most mornings that means a bowl of delicious, homemade muesli. 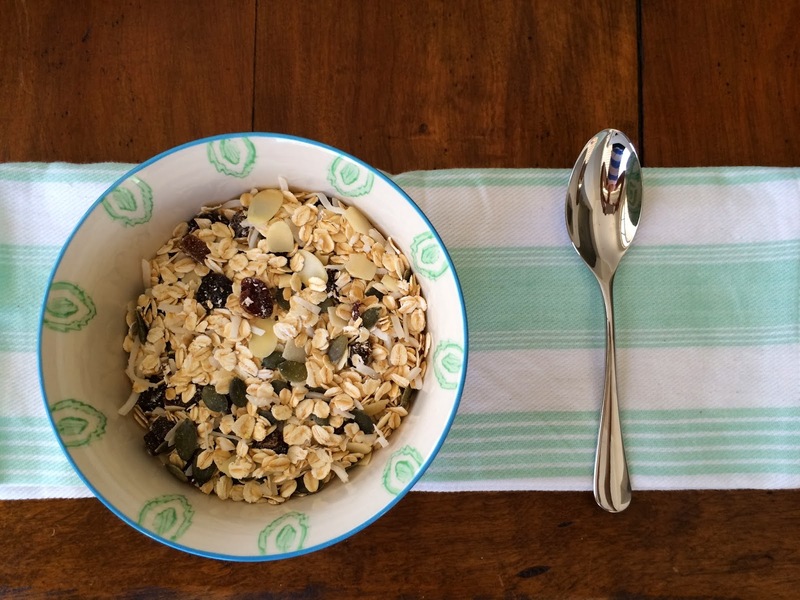 To be completely honest, my gorgeous hubby usually mixes up our all natural muesli. But he's busier than I am this week, so I took it upon myself to create our latest batch. 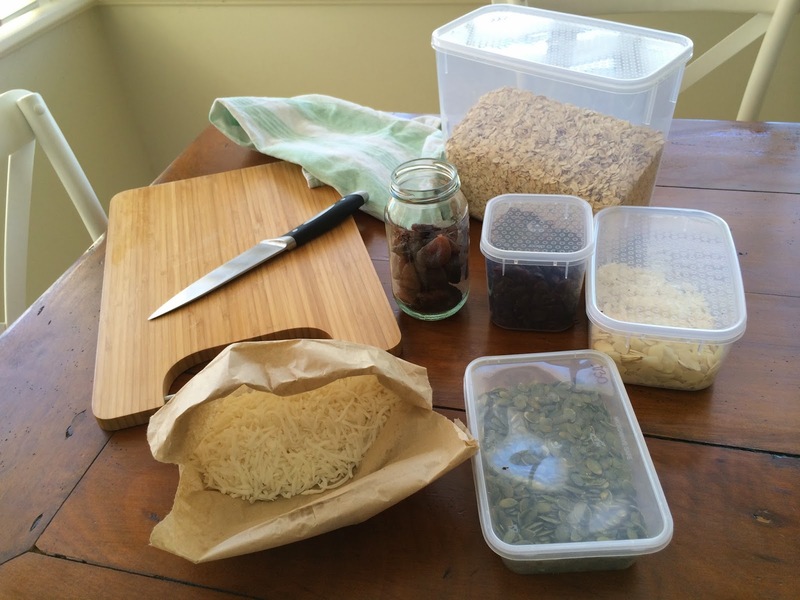 Here's my easy 5-step method to making delicious, organic muesli. Buy as many organic ingredients as possible, and mix it up! This is the recipe this week, but next week may see dates, walnuts and sultanas mixed in with the oats. I purposely left out amounts of the ingredients because it should all be done to taste. As a guide, the rolled oats by themselves should equal between one-half and two-thirds of your muesli container, and a little goes a long way when it comes to the other ingredients. I am so lucky to live in a neighbourhood with a fabulous organic food co-operative - the Manly Food Co-op - which sells all the ingredients I need for my muesli in bulk bins. Those of you who have read my book know that I have a love-hate relationship with Co-op shopping. Since you have to bring your own container to fill, there is a level of organisation I don't naturally posses as it relates to shopping, so it can at times feel like a mission. Luckily for the planet (and my health! ), my LOVE of saving so much packaging whilst supporting organic food growers outweighs my organisation frustration, and I'm a Co-op regular. Bulk grains, legumes, dried fruit and more at the Co-op. We have been members of the Co-op for a few years, and my hubby volunteers in the shop about once a month, so we get fabulous discounts. If you're a Manly resident (or Sydney resident!) you should definitely check it out. 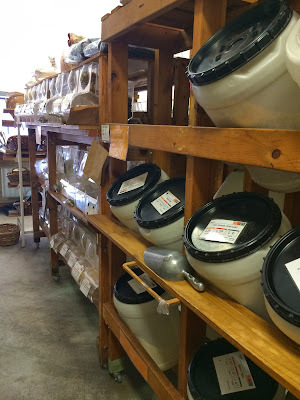 If you don't have a co-op, the next best thing is a health food store with bulk bins (like Whole Foods or Sprouts for my US readers). If that is not possible, you can buy all the ingredients at your local grocery store; buy in the largest size possible to reduce packaging. 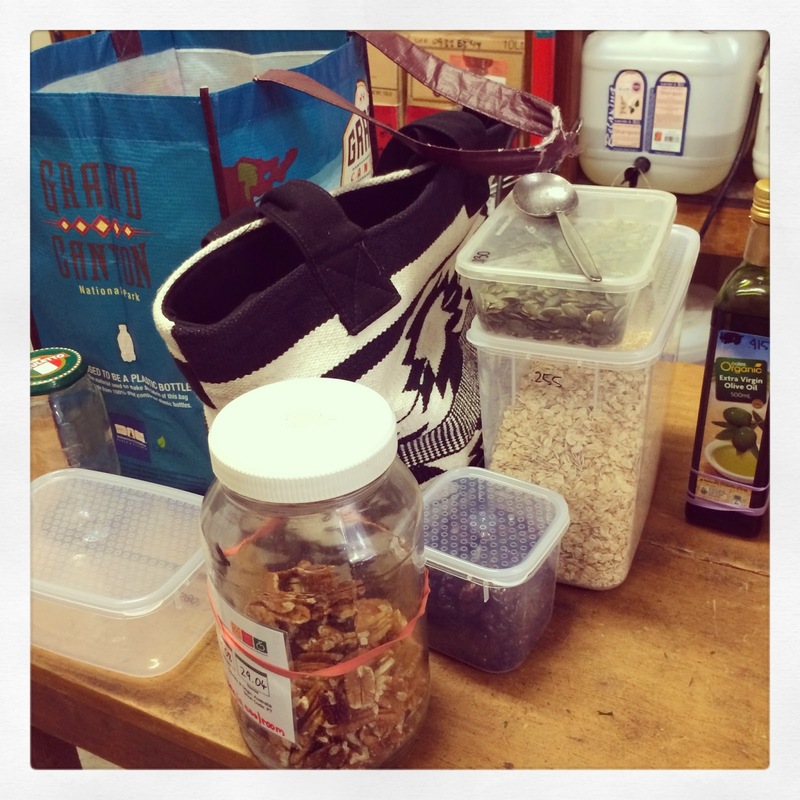 Gather all your ingredients, your muesli container, a knife, cutting board and mixing spoon. Lucky me! This week I only needed to chop the apricots, everything else was already the perfect muesli size. Don't be alarmed by the colour. 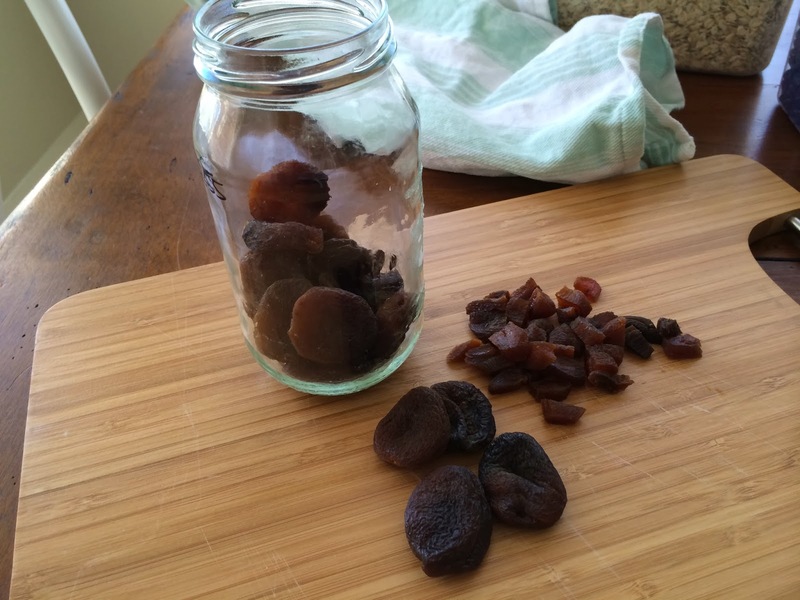 These are all-natural dried apricots, with no sulfates or other preservatives to maintain the orange colour. Okay, they are not quite as pretty, but they are just as tasty, and healthier for me, too. 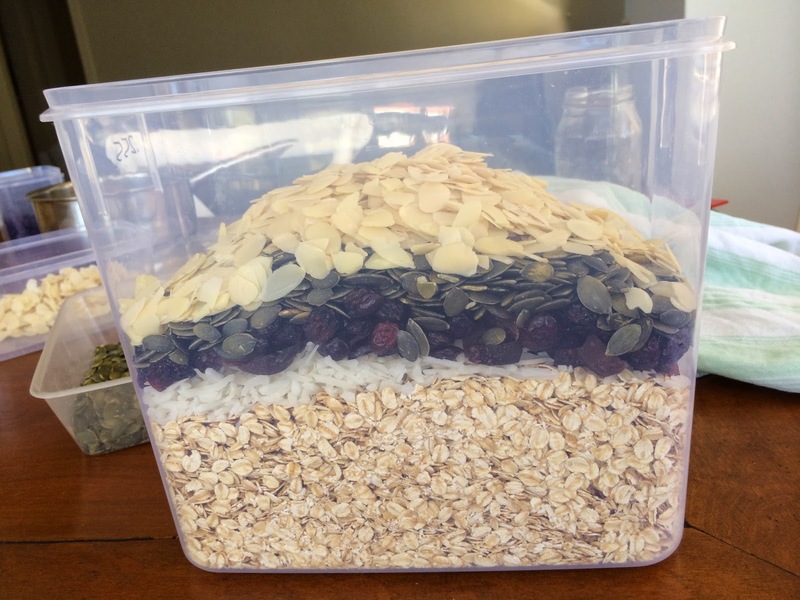 Remove about half the oats and layer in your tasty ingredients. Don't worry - this container is BPA-free! 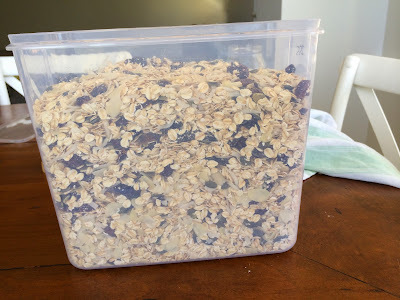 Give it all a stir (or put the lid on the container and roll it around a few times), then add the remaining oats and give it another stir or roll. There you have it - natural, organic, no added salt or sugar, muesli. Enjoy with your favourite milk, or over yogurt and honey, and sprinkle on a little LSA and maybe some cinnamon to get your day off to a great start. Want to know more ways I live my life sustainably everyday? Keep up with me on Twitter and Instagram for all the bits that don't make it onto the blog. My instagram while I was shopping!